I have a breeding pair of Angels that have been unsuccessful at raising their own fry for the last year or so. They can consistently hit the swimmer stage, at which point the dad decides they're too tasty looking and gobbles them all up. I'd like to see if I can raise them myself once they hit swimmer stage. What's the best way to go about this? The current batch just hit swimmer stage today. For now, I sucked them up with a turkey baster and moved them into a floating plastic breeder box. My previous two attempts I used a mesh breeder box, but the babies kept trapping themselves between the mesh and the plastic box frame and died :( Unfortunately, I've discovered the babies can squeeze out through the slots (not easily, but if I try to refresh the water in it they can get pulled out from suction), so this won't work long either. I have a 20g long with a cycled sponge filter and heater that I can transfer them to for grow out, but I'm not sure the best time or way to do this. Do I just fill the 20g with water from the parents tank? Or can I put fresh water so it's perfect? I'm not sure how much chemistry change babies can handle... The parents tank is around 20-40 nitrates because every time I want to do a water change they've laid more eggs and I don't want to disturb them, so I don't get to do my weekly 50% water change that I'd like to do... Usually I can get 1 water change in each month in between their failed attempts. What should go into the tank other than the heater & filter? I'm snowed in right now, but once work opens up again I can't feed them every few hours like I am now. I'd like to have something in there they can forage on while I'm away for 8 hours. I have floating plants and driftwood from the parents tank I could transfer, or I have lava rock with bolbitus ferns in a 10g tank I could move over. Anything else I should know to give these guys the best shot at making it? Thanks! First, I would like to preface this with the fact that I have never kept angelfish, so what I recommend is based off my experience with fish fry in general. For fry, especially for some sort of sustained food, I would recommend either vinegar worms or baby brine shrimp. These, since they are living, won't decay and ruin the water when not eaten immediately. Unfortunately, if you do not already have a colony of vinegar worms or BBS, the only method of getting these is from a fish store (and the one that I get mine at has point blank told me it's better to do your own, since you can feed them stuff to help your fish grow instead of whatever the shipper for the store does [if they do anything at all]). When it comes to when to put them in the tank, I would as soon as you can. I would also start with as clean of water as you can, though you might need to drip acclimate them to the new water parameters. Babies are sold in stores both because everyone loves puppies but full grown dogs stay at the pound, as well as they are faster to adapt to changes (and lastly because who has time to wait grow all the fish out before selling them to make their money back). Old or young, one should always drip acclimate a fish to a new tank, as it is the shock of totally different parameters that kills, not the parameters themselves. As far as what to transfer, every tank should have some sort of live plant (my opinion, both because they look nice and I'm lazy, but still merely an opinion) to help remove nitrates. If the fry that you have will eat plants, that will also help with feeding while you are gone. I put java moss in all my crayfish grow-out tanks, because I know it will get eaten and if they are eating the plant then they are not eating each other (crayfish are cannibals), as well as gives them places to hide. 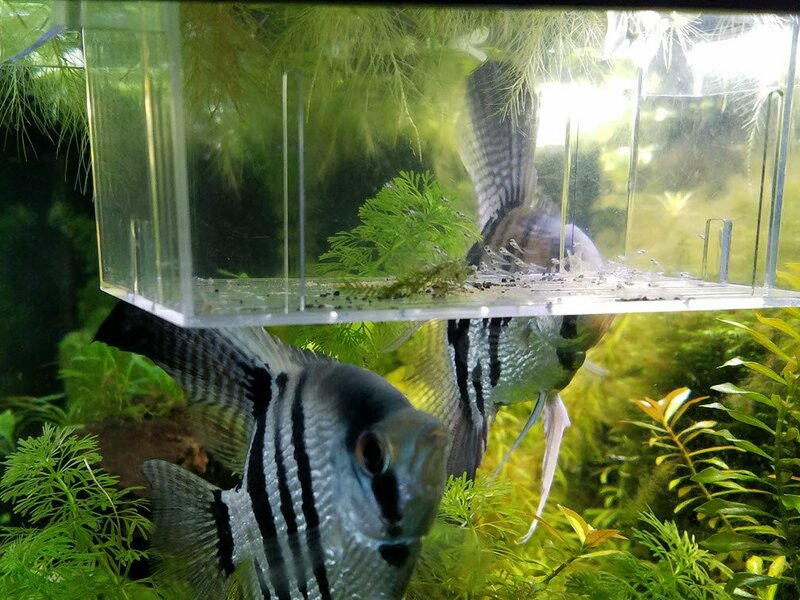 However, if Angelfish don't eat plants and you are willing to do all the necessary water changes to make sure the nitrates stay very low, and there are plenty of places for the fish to hide and feel safe, then the plants are not needed. I recommend some sort of plant for nitrate removal and hiding places, but that's all it is: my recommendation.